These are so cute! I was wondering how I could print these off. I signed up for the newsletter, but can’t seem to find a link. I just signed up for the first time, will I be able to access the link when I get my first newsletter? Thanks so much for signing up – yes, the link is always at the bottom of the newsletters. The link will change occasionally, so be sure to check for the most current newsletter to keep access 🙂 Enjoy! I just signed up and was hoping to use the Pizza Bingo for a birthday party Friday. Any chance the newsletter with the link will be sent out in time? I just signed up and was just wondering when the next newsletter is coming out? 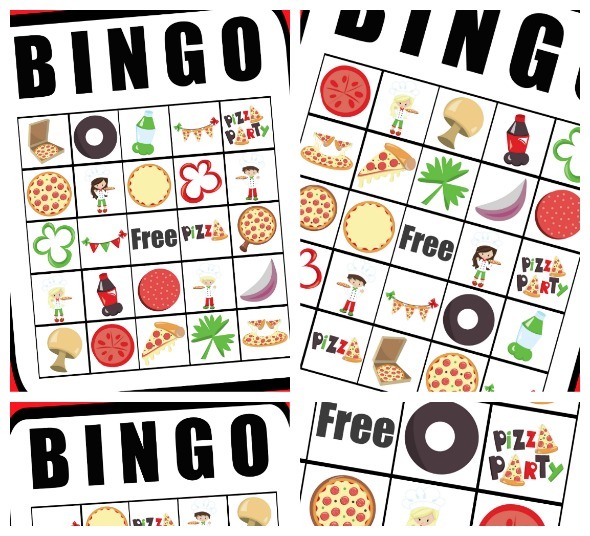 I would love to print the pizza bingo for an upcoming event! Signed up today! Any chance of getting link to pizza bingo cards emailed to me? Am doing a summer camp based on food and plants next week called There are Plants in My Pizza. Pizza bingo would fit in perfectly. Hi Lynn! You should have received a welcome email when you signed up, with the link to the folder with the subscriber exclusives. Just go into the folder that has ‘2016 and 2017 printables’ and search for the Pizza Bingo 🙂 Enjoy! I just signed up and was hoping to use the Pizza Bingo for a party tomorrow night. Any chance to get the link for that? You should receive a welcome email – in that email it has the link to the folder where all of our subscriber-exclusive printables are stored. Just to there, look in the folder from past years, and find the Pizza Bingo. Enjoy!